So many mootreats to deliver! 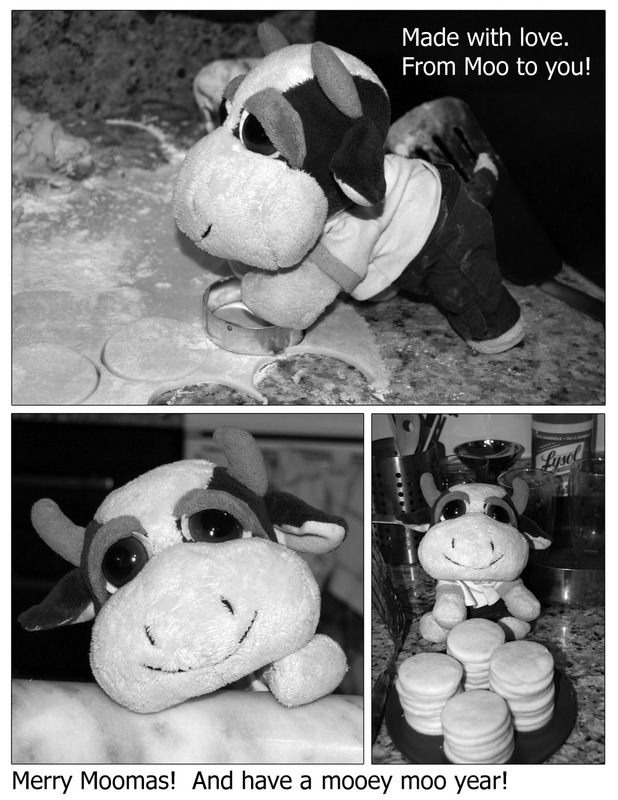 With the holidays upon us, I’ve been a busy bovine baking up a storm! I don’t usually have a lot of time or energy to bake, but I really do enjoy it! Especially since I am horrible at cooking, that is if you call starting frying pan fires horrible. Baking seems to be the only type of domestic task I can manage. Below you’ll find some of my favorite recipes and they’re all pretty easy and quick to make! Everyone seems to enjoy them and although hoof made treats can take some work, it’s rewarding to watch people enjoying them. Shortbread is a classic recipe and this one is classically Canadian due to the cornstarch. This, along with the Nanaimo bar recipes were obtained from the mom of one of the female hums ex-boyfriends. I’ve managed to improve upon the recipe since she got them, and if you follow my tips below, you’ll wind up with buttery rich shortbread cookies too! Be liberal with the vanilla. Forget about trying to measure out 1 teaspoon, just pour until the batter is slightly off white. The original recipe called for dropping the dough straight onto the cookie sheet, but I’ve found it doesn’t spread like it claims it does. So I opt instead to roll it out and cut it into shapes. Make sure you don’t use too much flour or you’ll lose the wonderfully buttery consistency. Instead, after you’ve cut them out, use a metal spatula to gently lift them from the rolling surface and transfer them to a baking sheet. There’s no need to grease the baking sheet, as the amount of butter in the cookie will ensure they don’t stick after they’re baked. To avoid browning the cookies, use a high quality baking sheet. My favorite baking sheets are double insulated ones I bought on Golda’s Kitchen online. I find using older or cheaper baking sheets results in cookies that are slightly browned on the underside. Make sure that after you remove the cookies from the oven, you let them cool on the baking sheet for 2-3 minutes, then gently remove the cookies onto a rack to fully cool. Use either a metal spatula to remove them from the baking sheet, or if you cut them into rounds, gently twisting them usually works. If you let them cool all the way on the baking sheet, they will crumble when you remove them. Embrace the KitchenAid stand mixer! This makes the whole process much quicker. I use the flat beater to cream the butter and do the initial mixing of the dry ingredients. Then I switch to the dough hook to finish it off. 2. Add the icing sugar, cornstarch and flour. 3. Once the dry ingredients are incorporated, add vanilla. 4. Beat entire mixture until fluffy (the fluffier the better). 5. Roll out the dough to the desired thickness, cut into shapes, and put onto cookie sheet. 6. Bake at 350° F for about 12 min. They should not brown so watch carefully. 7. Remove from the oven once done, allow to cool 2-3 minutes on the baking sheet, then transfer to a wire rack to cool completely. 8. These store indefinitely in a covered container at room temp. I’ve found that the reverse Nanaimo bar recipe always turns out looking nicer than the regular Nanaimo bars, especially when you’ve cut them up. Both recipes are pretty easy to make, but if you’re in a rush, I recommend putting the pan in the freezer after pouring the filling in on top of the crust so it sets up fast before completing the final layer. 1. Combined butter, sugar, cocoa, vanilla and egg in a pyrex bowl. Mix well and set bowl in boiling water. 2. Cook stirring constantly until the butter has melted and the mixture resembles thin custard. 3. In a separate bowl combine graham cracker crumbs, coconut and nuts. 4. Add the cooked mixture and blend thoroughly. 5. Pack evenly into a 9" square pan. 1. Combine 3 tablespoons milk with 2 tablespoons vanilla custard powder. 2. Cream 1/4 cup butter and add the custard mixture.Then blend in 1 cup sifted icing sugar adding more if necessary to make good spreading consistency. 3. Spread over bars and let stand at least 15 min or place in freezer until harden and set. 1. Melt 3 oz semi-sweet chocolate with 1 tablespoon butter and spread over the middle layer. 2. Let stand or place in freezer until harden and set. 3. Cut into bars & enjoy. 1. Combine butter, white chocolate, and egg in pyrex bowl. Mix well and set bowl in boiling water. 2. Cook, stirring constantly until the butter and white chocolate have melted. 3. In separate bowl combine graham crumbs, coconut and almonds. 2. Cream 1/3 cup butter and add the custard mixture and vanilla. 3. Then blend in 1 1/3 cups sifted icing sugar and 2/3 cup sifted unsweetened cocoa powder. 4. Spread over bars and let stand at least 15 min or place in freezer until harden and set. 1. Melt 4 oz white chocolate with 4 teaspoons vegetable oil and spread over the middle layer. Or Crack Cookies as some of my friends have called these. These delicious chocolate cookies are nothing but pure chocolate and sugar! The chocolate crackle top cookies and chocolate truffle recipes come from a book I’ve had for over a decade now, called The Ultimate Encyclopedia of Chocolate by Christine McFadden and Christine France. After you chill the dough, if it’s too hard, let it sit out for a bit at room temperature until it’s soft enough to work with, otherwise they won’t roll into balls very well. I recommend flattening the cookies with a fork to the desired thickness. They do not seem to spread and flatten on their own like the original recipe indicates they do. 1. Grease two or more large baking sheets. In a heavy saucepan over low heat, melt the chocolate and butter until smooth, stirring frequently. Remove from the heat. Stir in the sugar until dissolved. Add the eggs, one at a time, beating well after each addition. Stir in the vanilla. 2. Sift the flour, cocoa, baking powder and salt into a bowl. Gradually stir into the chocolate mixture in batches to make a soft dough. Cover in plastic wrap and chill for at least 1 hour, until the dough is firm enough to hold its shape. 3. Preheat oven to 325F. Place the confectioners’ sugar in a small, deep bowl. Using a small ice cream scoop or round teaspoon, scoop the dough into small balls and roll between your palms. If the dough is very stiff, let it sit at room temperature until malleable. 4. Drop the balls, one at a time, into the confectioners’ sugar and roll until heavily coated. Remove each ball with a slotted spoon and tap the spoon against the bowl to remove excess guar. Place the balls on the baking sheets, about 1 ½ inches apart. Press down the cookies with a fork to the desired thickness. 5. Bake the cookies for 10-15 minutes or until the top of each feels slightly firm when touched with a fingertip. Let set for 2-3 minutes. Transfer to wire racks and let cool completely. These truffles are fairly easy to make, even a monkey could do it! The hardest part is resisting the urge to just eat it before rolling them into balls! Or fending off hungry humans trying to the mixture straight out of the bowl! If the chocolate truffles have set too hard, let the mixture sit at room temperature for a bit until you can work with the mixture easily. Otherwise, you will have a difficult time forming them into balls. 1. Pour the cream into a saucepan. Bring to a boil over medium heat. Remove from heat and add the chocolate, all at once. Stir gently until melted. Stir in the butter until melted, then stir in the brandy. Strain into a bowl and cool to room temperature. Cover the mixture with plastic wrap and chill for 4 hours or overnight. 2. If mixture is too firm, let sit at room temperature until mixture has softened a bit. Line a large baking sheet with baking parchment. Using a small ice cream scoop, melon baller or tablespoon, scrape up the mixture into 20 large balls or 30 medium balls and place on the lined baking sheet. Dip the scoop or spoon in cold water occasionally, to prevent the mixture from sticking. 3. If dusting with cocoa powder, sift a thick layer of coca onto a dish or pie plate. Roll the truffles in the cocoa, rounding them between the palms of your hands (Dust your hands with cocoa to prevent the truffles from sticking). Do not worry if the truffles are not perfectly round. Or roll the truffles in very finely chopped pistachios. Chill on the paper lined baking sheet until firm. Keep refrigerated for up to 10 days or freeze for up to 2 months. 4. If coating with chocolate, do not roll the truffles in cocoa, but freeze them for 1 hour. For perfect results, temper the chocolate. Or simply melt it in a heatproof bowl over a saucepan of barely simmering water. Using a fork, dip the truffles, one at a time, into the melted chocolate, tapping the fork on the edge of the bowl to shake off excess. Place on a baking sheet, lined with baking parchment. If the chocolate begins to thicken, reheat it gently until smooth. Chill the truffles until set. I highly recommend coating these in chocolate! Slightly more difficult to make than the chocolate truffles, but equally delicious and much lighter tasting! Well, unless you go heavy on the booze, which is highly recommended! Remember to chill the whip cream and bowl really well before you start, or you’ll find that the cream doesn’t whip properly and you’ll have to start over again. Instead of whisking by hand, you can use your KitchenAid on speed 8. The recipe recommends that you whip the cream and booze together, but I find that the results are much better if you wait until the whip cream starts holding its shape, then you add the alcohol a bit at a time until it’s all incorporated. 1. Melt the chocolate in a heatproof bowl over a saucepan of simmering water, stir until smooth, then cool slightly. 2. Using a wire whisk, whip the cream with the whiskey in a bowl until thick enough to hold its shape. Or use a KitchenAid standmixer. I recommend chilling the bowl and cream well first then doing this step, as well as incorporating the whiskey after you have beat the cream until it holds it shape. 3. Stir in the melted chocolate and confectioners’ sugar, mixing evenly, then let set until firm enough to handle. 4. Dust your hands with cocoa powder and shape the mixture into bite size balls. Coat in cocoa powder and pack into paper wrappers or boxes. Store in the refrigerator for up to 3-4 days if necessary. Any little cow who wants to back Christmas macarons and share them is a good moo of mine! Oh V, if only I was talented enough to get macarons to work! Our oven is too tempermental for delicate delights such as macarons!